The notion of a Smart Factory today is based on utilizing modern Industrial IoT concepts. While it is not practical for existing brown fields to immediately modernize and adopt all these technologies and best practices, it is however possible for factories to cherry pick individual technologies and practices as a path to gradually modernize over time. These include technologies and best practices that allow for seamless machine interoperability, easy data sharing between machines, MES, ERP, and SCADA systems. This webinar will provide an overview of some of these technologies and will also discuss the new industry standards that make such a migration possible. 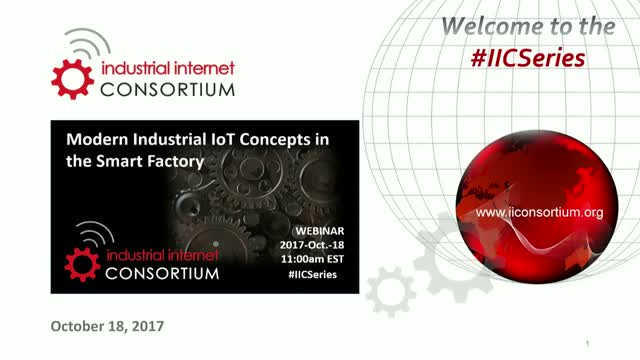 We’ll also share a proof of concept, the IIC Smart Factory Web Testbed, which is a network of smart factories with flexible adaptation of production capabilities and sharing of resources and assets to improve order fulfillment. The Smart Factory Web forms a network of smart factories with flexible adaptation of production capabilities and sharing of resources and assets to improve order fulfillment. Key challenges being addressed: How can we connect factories to the Smart Factory Web and exchange data reliably? How can we provide the information securely at the right granularity to authorized partners? How can production capabilities be adapted quickly and efficiently in response to orders?